This solera is made from an 18mm thick board of MDF glued to an 18mm thick board of plywood and then another of 12mm MDF. This makes it more stable. Extra stability is provided by the timber battens screwed underneath. 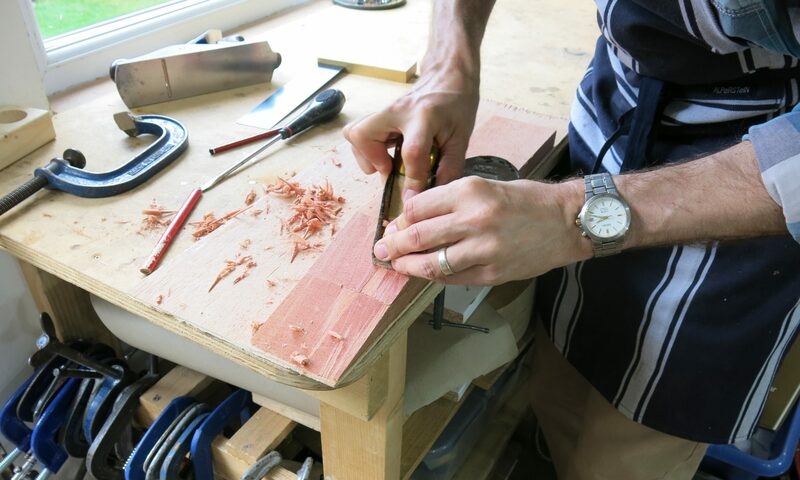 These can be removed while clamping on the strutting etc, but are in place when gluing on the back – it is important to make sure the neck angle is correct at this stage. The bridge area was cut out because I have made some soundboards where the soundhole is too far from the bridge for clamps to be inserted. In this case the bridge must be glued to the soundboard early on, and the cutout allows the bridge to be accommodated face-down into the solara. The solera extension that supports the neck should either be perfectly flat, or sloping down between 1.0mm and 1.5mm so that the string height above the frets at the 12th fret is correct. The amount cannot be given precisely because it depends on all the other factors involved; the height of the soundboard dome, the thickness of the fretboard, the preferred height of the strings at the bridge. It is best to draw out accurately, full size, a side elevation of this, to understand how these factors inter-relate. Hello Mr. Courtnall. I want to make a friederich style guitar. Also I want the neck angle to be zero (0). How much should be the depth at the dome?thanks. You can make the neck flat, that is, no angle. If the dome is 2mm to 3mm it will work. Best to start with a fretboard about 7mm to 8mm thick because you will have to taper it down a little towards the 19th fret to get 3.5mm action at fret 12 on 6th string.